Female; At least 5’2” in height; College graduate; Proven working experience in retail cashier or ales; Basic PC knowledge and familiarity with electronic equipment (e.g. cash register, scanners, money counters etc. ); Strong communication and time management skills; Customer satisfaction-oriented; Attention to detail and mathematic skills; Sales skills; Can handle exchanges and refunds in a quick, efficient manner; Can maintain accurate cash drawer; Can tally of the funds in the cash register when required during a shift and produce transaction reports. Male; Candidate must possess at least a Bachelor’s/College Degree, AutoCAD, IT courses or equivalent; Required skill(s): Sketch up, MS Office, MS Excel, Adobe PhotoShop, AutoCAD; Preferably 1 – 2 years’ experience, specializing in Architectural Design or equivalent; Willing to work extended hours; Can work in a minimal supervision in a fast-paced environment; Excellent English communication skills both oral and written; Can operate computer numerical control (CNC) machine. At least 2-3 years’ experience in heavy equipment / trucks. At least 2-3 years’ experience in heavy equipment / trucks; With background in electronics; With knowledge in computer box repair. At least High school graduate; At least with knowledge in Stencil of Chassis etc. At least High school graduate; With experience as Latero. Degree in Civil Engineering; License Civil Engineer is required; Minimum of 5 years of design experience with knowledge on preparation of civil/site work drawings, civil evaluations and plans; Able to prepare and edit floor plans on a schematic level; Proficient in AutoCAD and other Microsoft Office Applications; Proficient in English both written and oral; Possess a Philippine Passport and a Driver’s License. 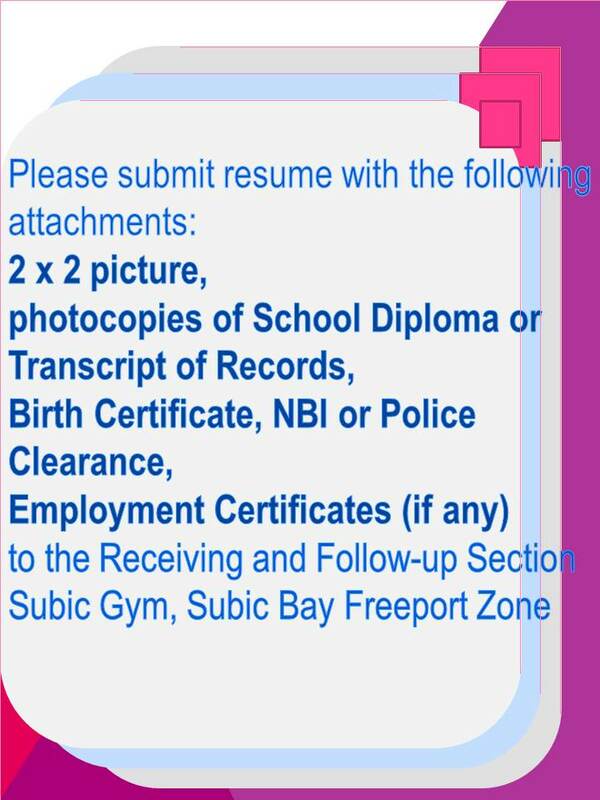 Degree in Mechanical Engineering; License Mechanical Engineer is required; Minimum of 5 years in mechanical engineering design (HVAC, BAS, Piping, Sprinkler Design); Adequate relevant trainings; Proficient in AutoCAD and other Microsoft Office Applications; Excellent written and oral communication skills; Possess excellent problem-solving skills and a creative approach for new technologies; Possess a Philippine Passport and a Driver’s License. Degree in Electrical Engineering; License Electrical Engineer is required; Minimum of 5 years in design and field experience; Adequate relevant training; Proficient in AutoCAD and other Microsoft Office Applications; Excellent written and oral communication skills; Possess excellent problem-solving skills and a creative approach for new technologies; Possess a Philippine Passport and a Driver’s License. Degree in Civil Engineering with a sound knowledge of structural engineering fundamentals; License Civil/Structural Engineer is required; Minimum of 5 years of design experience with knowledge on preparation of civil/site work drawings, civil evaluations and plans; Able to prepare and edit floor plans on a schematic level; Proficient in AutoCAD and other Microsoft Office Applications; Proficient in English both written and oral; Possess a Philippine Passport and a Driver’s License. Bachelor’s Degree in Accountancy, CPA is required; At least 10 years working experience in the related field is required; Experience in BPO industry or shared service organizational set-up, preferred; Thorough knowledge of accounting principles and procedures; Excellent accounting software user and admin skills with a strategic vision; Excellent collaboration, verbal and written communication, people management, decision making and interpersonal skills. Excellent technical knowledge of PCs/Notebooks/Devices and desktop hardware; Working technical knowledge of current protocols, operating systems and standards; Ability to operate tools, components and peripheral accessories; Microsoft Desktop Support Technician an advantage; Software and Hardware Troubleshooting; Windows 7, Windows 10 experience; Current version of Microsoft Office support; Working knowledge of SMS, AD, Office 365, Exchange, Skype for Business, VoIP and remote control tools; Able to operate effectively in a team environment with both technical and nontechnical team members. Female; Graduate of BS Accountancy; Pro-active. Flexible and Adaptive; Can perform with minimum supervision; Fresh graduates are encouraged to apply. Male; Graduate of 4 years course; Fresh graduates are welcome to apply. Male / Female; Must have Security Guard License; Must be attentive and flexible; Can work under pressure; Must have experience in the same field; Preferably around Zambales area. Male / Female; Graduate of any 4 years course; With experience in the same position in a manufacturing firm is an advantage; Must be flexible and easy to train; Can work in a pressure driven environment; Must be knowledgeable in Microsoft Word and Excel. Male; with Driver’s License; Know route in SBMA, Zambales and Manila; Can work in a pressure driven environment. Male; Must have NC II training in similar field; Must have experience in the same field; Must be hardworking; Willing to render overtime if necessary; Can work under pressure. Male; A graduate of ARCHITECTURE or any related course; With at least 6 months’ experience as AutoCAD Operator; Good analytical skills and problem-solving skills; Can work in minimum supervision. Male / Female; At least High school or College level; With knowledge in computer; Willing to be trained; Willing to work under pressure.